When you get invited—or rather invite yourself—to go check out the new 26 Savage from Adrenaline Custom Boats, the first 26-foot cat from the Phelan, Calif.-based company to hit the water, you make sure you’re on time and ready to go at the docks of Bob and Andrea Teague’s home in Discovery Bay, Calif., as expected. So that’s where I was at 10:30 a.m. on Sunday taking in the reactions of a couple of new owners who appeared to be infatuated with their new outboard-powered sport cat. A little more than five years ago, Speedonthewater.com reported about Bob Teague, owner and founder of Teague Custom Marine in Valencia, Calif., driving all the way to the New York-Canada border to pick up his former Schiada Boats 21 River Cruiser, which he built in 1987 and sold in 1997 to the same customer he bought it back from in 2013 (read the story). With the Big Cat Poker Run in Discovery Bay, Calif., on the horizon this week, there’s a ton of excitement in the Teague Custom Marine camp. Not only is the Valencia, Calif., high-performance marine shop the title sponsor of the annual event on the California Delta that benefits the Discovery Bay Lions Club, the company is going to be showing off its new 31-foot “TCM 31” catamaran from DCB Performance Boats that is powered by a pair of TCM’s latest 1,400-hp supercharged engines connected to Mercury Racing No. 6 drives with lower units blueprinted by Wilson Custom Marine. The kid is only four years old, but after seeing him at the Big Cat Poker Run in Discovery Bay, Calif., last month and the Lake Powell Challenge in Page, Ariz., this month, I have a feeling little Cru Noack knows he’s a cool kid. 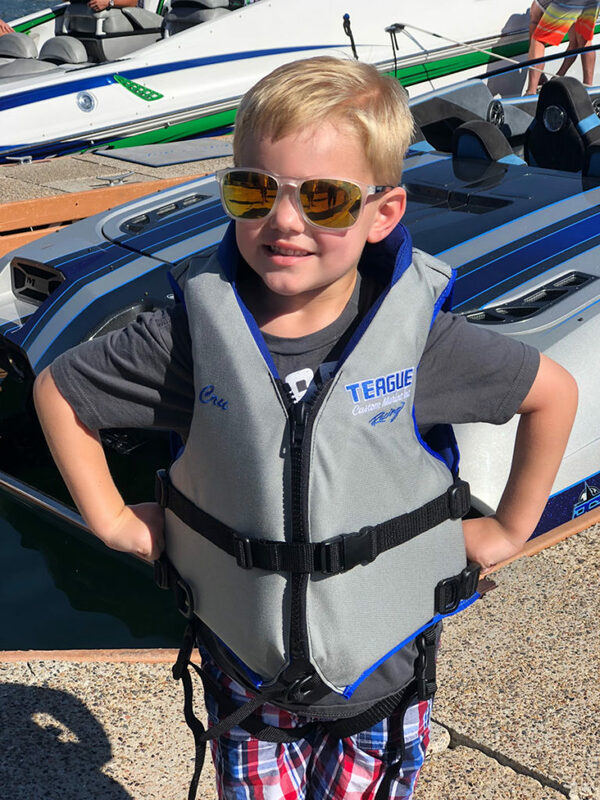 Now whether he knows how cool he is or how good he has it is another story as his parents, Cherilyn and Josh Noack, are two key members of Teague Custom Marine, the Valencia, Calif.-based company founded by Cru’s grandfather (and Cherilyn’s dad), Bob Teague. Cru Noack proudly wore his Lifeline life vest at Antelope Point Marina during the 10th Annual Lake Powell Challenge in September. Protected: Teague is Gifting Online Shoppers with Boat Bling in May!